I am trying to Wrap a text in the Cell using FPDF. here is my code. Now I want to Wrap that Xtra text which is there into the Cell. The xtra text should go into the second line. How should I do that. 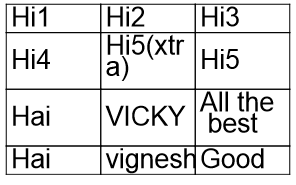 when I use MultiCell for that line $pdf->MultiCell( 20, 7, 'Hi5(xtra)', 1); It is changing into the following.. The MultiCell() is used for print text with multiple lines. I can see that MultiCell(), breaks the line so new cell will be placed below current position. In such case you can calculate x and y co-ordinate and calculate new position and set position after outputting every cell. I dont think Multicell is the solution for this.Problems in using multicell. More over we cant able predict how much height a cell may goes? 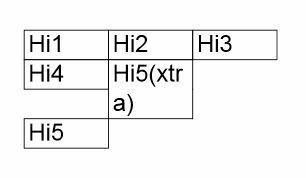 eg: if first cell text length is 50 and the second text lenght is 100 then its height differs so we cant able to create as a table row. Even the above answer helps to solve only the break of line but not overlap problem. Here i came with a new solution for this.a new function vcell() uses only cell in it to make the expected output successfully. $w_text=str_split($text,7);// splits the text into length of 7 and saves in a array since we need wrap cell of two cell we took $w_text, $w_text alone. 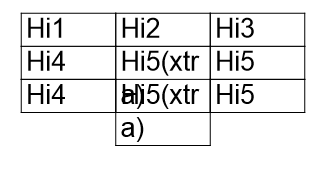 // $this->Cell($c_width,$w_w2,$w_text,'','','');// for 3 rows wrap but increase the $c_height it is very important. I have faced the same problem and try to find a way of whether is a cell enough or not for the text and divide height by amount of line and use result as for the particular cell height. But, it only make code very complex. then I switch to a library called html2pdf. It creates html table which no any above mentioned conflict, And that page convert to pdf file. Use html2pdf library.. it is the easiest way of creating pdf with automatically divided cell. you can download it here and there are many guides in the internet. Try this: You can pass column widths, column alignments, fills and links as arrays. if width is a number, it will be the width of the whole table. Not the answer you're looking for? Browse other questions tagged php pdf fpdf word-wrap or ask your own question.